Happy Valley Dairy are handmade with full cream milk by fully qualified and experienced cheese makers using traditional methods. Happy Valley offers a wide range of distinctive varieties, including Mozzarella, Grated Parmesan, Four Cheese Blend, Burger Slices, Cheese Slice, Deli Slice, Cheddar, Processed Cheddar Cheese, Cream Cheese, Fetta & Fetta Crumble and ESL Milk & UHT Milk. The soft, smooth texture and mild, full cream flavour of our mozzarella cheese make it the perfect ingredient for a simple caprese salad with fresh tomatoes and basil. Or, with its superior melting qualities, it’s the ideal ingredient for delicious pizza and pasta dishes. It stretches exceptionally when melted and doesn’t burn easily when cooked. Happy Valley Dairy's Mozzarella is a stretched curd cheese made from pasteurised milk. The semi-hard cheese is still very soft in texture, is a strong source of calcium, and has a great shelf life for a mozzarella. Our blocks are vacuum packed for guaranteed freshness. Our shredded varieties are gas flushed to be longer lasting. Happy Valley Dairy's Grated Parmesan Cheese is 100% pure parmesan. We age it for six to eight months to give it a bold flavour with a rich, strong aroma. When grated, it won’t clump - it’s dry, sharp and very light in colour. 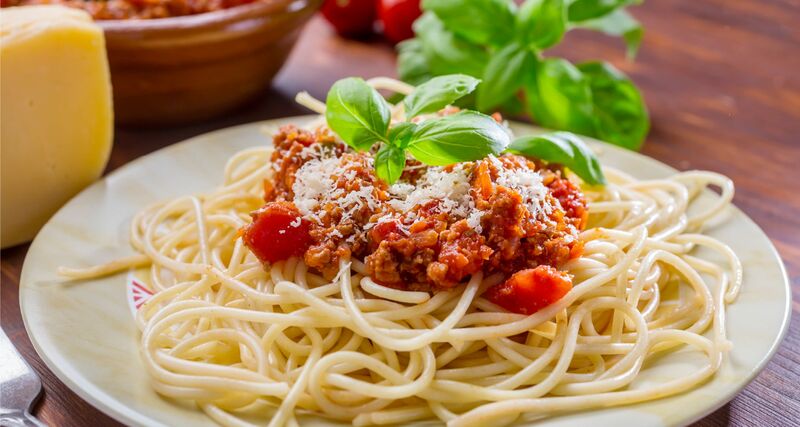 These qualities make our grated parmesan a great garnish for spaghetti and other pastas that not only tastes delicious, but looks enticing, too. An added benefit of Happy Valley parmesan cheese is the low moisture content. This allows it to be left on tables to be served over extended periods of time without any negative effects. This four cheese blend is a flavour some mix of cheddar, tasty, hi-melt and parmesan cheese that is ideal for quick and convenient kitchen creations. We’ve carefully chosen this selection of cheeses to make the blend perfect for melting, so it’s a great choice for pizza and lasagna toppings. Another great benefit is the relatively free flowing shred, which means it won’t clump when handled. Happy Valley Dairy's Four Cheese Blend is packed solely for the foodservice and catering market. Each pack is gas flushed and heat sealed for ultimate freshness. The clean, cheddar flavour of our burger cheese slices makes them the ideal addition to top off any juicy burger or hotdog. They’re smooth, creamy and mild, made with no artificial colours or flavourings – they’re light orange in colour, just like cheddar cheese should be. 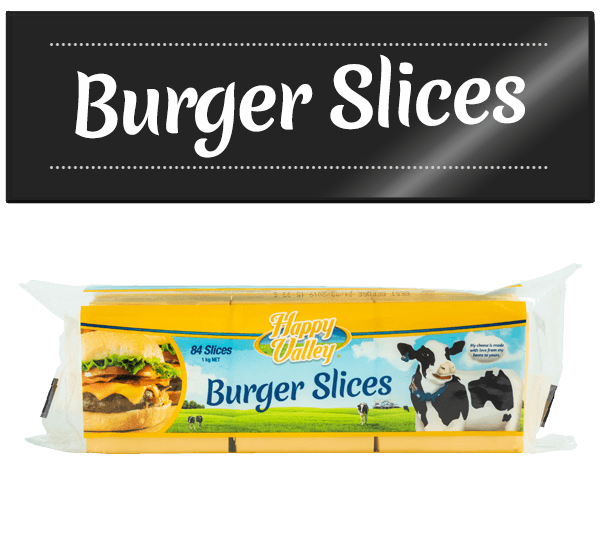 Happy Valley Dairy's processed slices are 65% natural cheese and suitable for vegetarians. They’re especially designed for food service applications. Perfectly sized and readily sliced, they’re convenient and easy to use in busy kitchens and quick service restaurants. 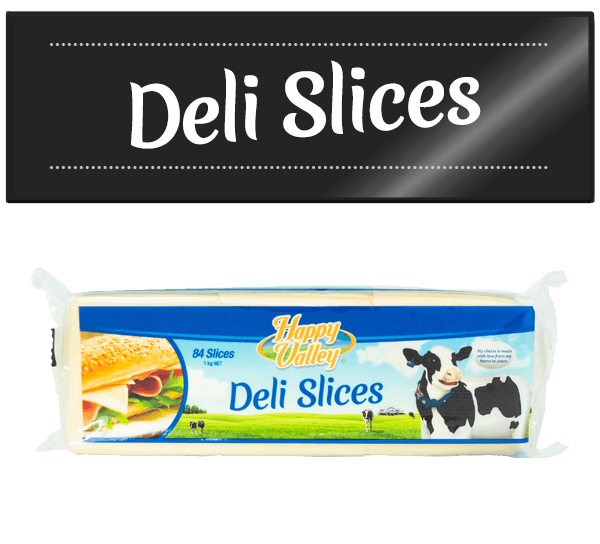 Happy Valley Dairy's cheese slices are a tasty filling for any classic sandwich. Our slices are silky smooth and mild to enhance that extra fresh taste. They are firm in body when refrigerated, yet delicately soft when served. Deliciously creamy and pale, they’re made without artificial colours or flavours. The processed cheddar slices are 65% natural cheese and suitable for vegetarians. They are sliced to the perfect size and conveniently packed for use in busy food service businesses, from boutique cafes to quick service restaurants. A classic sub, wrap or sandwich is incomplete without a fresh slice of mild cheddar. Happy Valley deli slices make the perfect inclusion. These soft, smooth cheese slices are mild to taste, so they perfectly compliment any other filling, but they still satisfy that creamy cheddar flavour. Our deli slices are 65% natural cheese and suitable for vegetarians. They have no artificial colours or flavours. Happy Valley Dairy's large pack sizes are made especially to suit food service businesses, including quick service restaurants. Preparation is made simple with tasty cheddar cheese already sliced for convenience. The full, rich flavour of cheddar cheese and its perfect melting properties have made it one of the most popular styles in the world. Our cheddar cheese has wonderful qualities, making it a standout choice for so many uses, from pizza and pasta toppings to simply being enjoyed by itself as a tasty snack. Aged between only three to four months, our Happy Valley Dairy's cheddar is a young natural cheese with a clean, mellow flavour. This makes it a great introduction to natural cheese for young children – and its high in calcium to strengthen their growing bones. It’s firm, yet not dry and crumbly, so it’s easy to slice. It’s also made with full cream, which means it has superior melting properties – ideal for toasted sandwiches and cheesy pizza toppings. We vacuum pack each block for guaranteed freshness, and we gas flush shredded packs for extended shelf life. A high quality processed cheese made from the only very best Australian ingredients. It is pale yellow in colour and has a firm body making it easy to cut or grate. It has a clean, mild and distinct flavour. A fresh white firm bodied cheese, produced from the highest quality Australian milk from our farms, characterised by its exceptional fresh taste. Happy Valley Cream Cheese is creamy in colour and is smooth in texture. It is clean, has a mildly acidic flavour with slight saltiness. Fetta is one of the most versatile of cheeses – great in antipasto, salads and many different styles of cooking. Happy Valley Dairy's deliciously light and salty Happy Valley fetta differs from the rest. Still a fresh curd cheese, ours is made from full cream pasteurised milk. The biggest difference is, we don’t remove the cream. This gives our fetta superior melting qualities. Not only that, it’s light and crumbly, yet still moist and full of flavour. It’s a great source of calcium, and ideal for vegetarians. Our 100% pure natural Australian-made fetta crumble is the easiest way to dress up any simple dish. It’s ready to be sprinkled over bruschetta, scattered across salads, or dotted onto omelets. With many versatile uses and a subtle, salty flavour, there’s so many ways to enjoy it. Happy Valley Dairy's Fetta Crumble is made with full cream and no artificial colours or flavours, which gives it great texture and taste. It’s also a great source of calcium, which makes it a simple and delicious way to keep bones strong and healthy – and its ideal for vegetarians. Best of all, the convenient container means it’s ready to use, saves time and money, and reduces waste. There are numerous benefits to drinking milk. With our ESL milk, made from fresh full cream milk, there’s no need for anyone to go without. Happy Valley Dairy's ESL milk, or ‘extended shelf life milk’, is a fresh full cream milk that goes through an ultra-pasteurisation process - it’s treated in high temperatures to kill off micro-organisms so it can last longer. When we treat our milk at Happy Valley, we make sure we retain the natural taste and characteristics of fresh milk. Being made from fresh full cream milk, it’s still a great source of calcium. It also provides a rich source of protein, carbohydrates, fats, vitamins, enzymes and minerals – everything the body needs for strength and vitality. These nutrients strengthen bones and teeth, provide energy, and are good for the eyes and skin. Our ESL milk is Free of chemical pesticides, synthetic fertilizers, growth hormones, antibiotics and GMOs (genetically modified organisms). Happy Valley Dairy's UHT milk is the most convenient way to still enjoy natural tasting milk, with all its valuable nutrients and vitamins, without the hassle of storing perishable products. 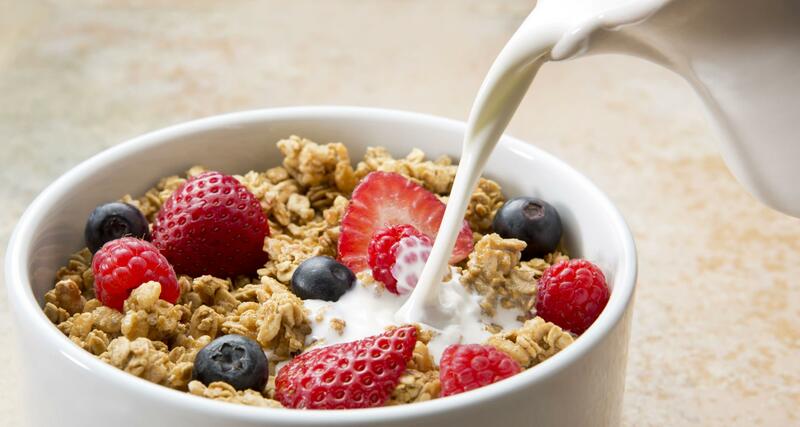 It can be enjoyed in coffee, smoothies, cereals and baking, just like fresh milk can. The ultra-high-temperature treatment of milk allows it to have a longer shelf life by destroying the micro-organisms that normally cause it to spoil. When we make our UHT milk at Happy Valley, we’re careful to keep the natural taste and creaminess, as well as the important healthy qualities. Our UHT milk provides a rich source of calcium to strengthen bones and teeth. It’s also a great source of protein, carbohydrates, fats, vitamins, enzymes and minerals, which provide energy and are good for the eyes and skin. 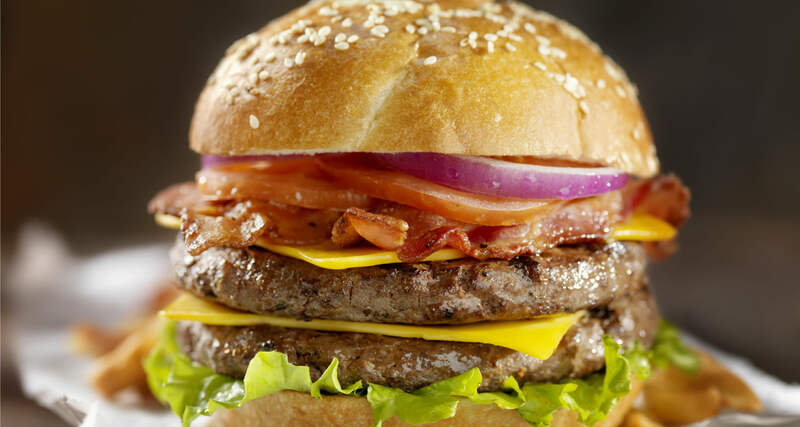 We don’t add any preservatives or additives.